With an aggressive aerial bombing campaign threatening the British Isles and a war rapidly spiralling out of control across the world, the RAF squadrons in places like North Africa initially had to make do with obsolete aircraft like Gloster Gladiators and Bristol Blenheims, until more modern replacements could be found. 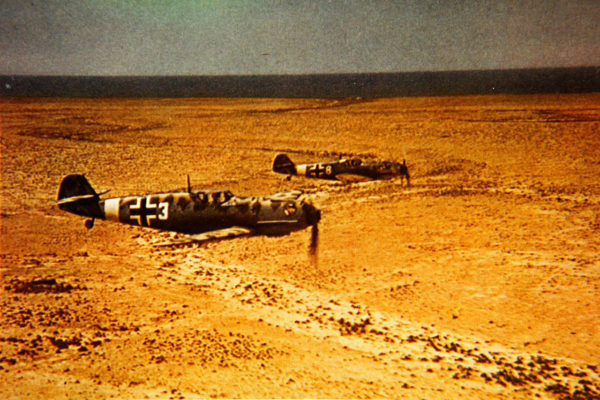 From the very beginning of the North African campaign, British and Italian airforces skirmished back and forth across the Libyan border, mounting bombing raids and long-range patrols to harass and disrupt enemy movement. Against the Italians, the deficiencies of the Gladiators and Blenheims were less apparent. The ageing Gladiators with resolute crew were able to hold their own against the Italian CR.32 and CR.42 bi-planes. A Hurricane IID of No. 6 Squadron RAF over the North African desert. Note the tank-busting 40mm cannons mounted under the wings. The arrival of JG.27 alongside Rommel’s Afrika Korps completely upset the balance of power in the air. 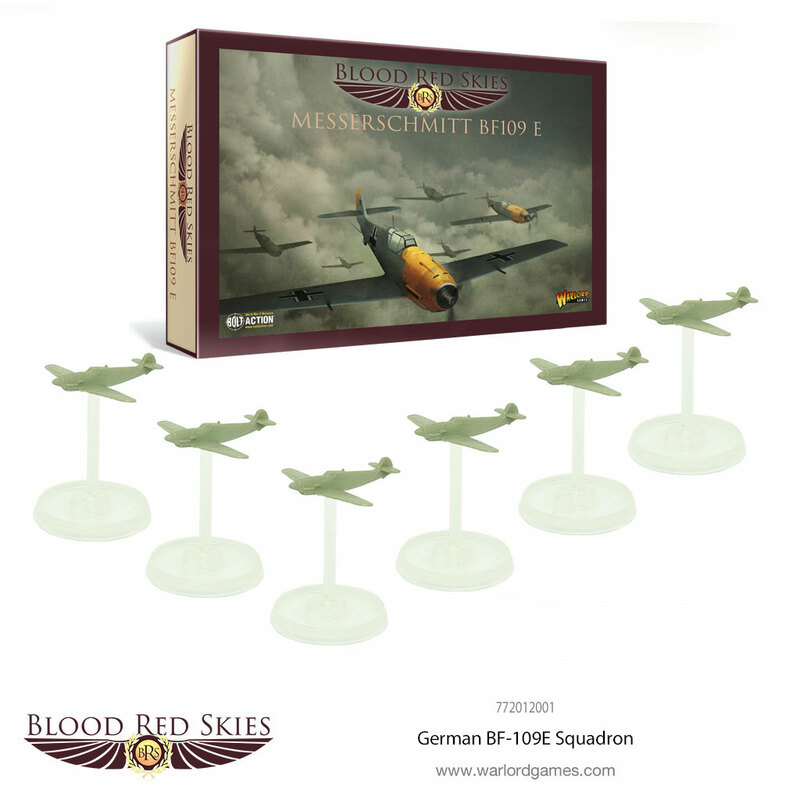 Equipped with the exceptional Bf 109E fighter, these pilots were all veterans fresh from the slaughter of Allied aircraft in France and the Low Countries and the air superiority campaigns over the Channel during the Battle of Britain. By this time, the newly-christened Western Desert Air Force (WDAF), made up of pilots from across the British Commonwealth, had re-equipped with British Hurricanes and American-made P-40 Warhawks and Kittyhawks. Despite the influx of more modern aircraft, the WDAF still suffered heavy casualties. However, their coordination with ground units and the development of effective close air support tactics often swung the battle in the favour of the allies. By the time JG.27 were redeployed from their bases in the Balkans and the Soviet Union, the WDAF had upgraded from the obsolete Gladiator to the relatively modern Hurricane and P-40. These single-engined monoplanes were no match for the predatory Bf 109, especially when flown by the inevitably inexperienced and under-trained pilots. The quality of the opposition allowed the pilots of JG.27 to rack up cricket scores in terms of enemy aircraft shot down, with the wing shooting down 1,166 aircraft between April 1941 and November 1942. Three pilots, Hans-Arnold Stahlschmidt, Gunther Steinhausen and Hans-Joachim “The Star of Africa” Marseille accounted for 250 kills between the three of them. 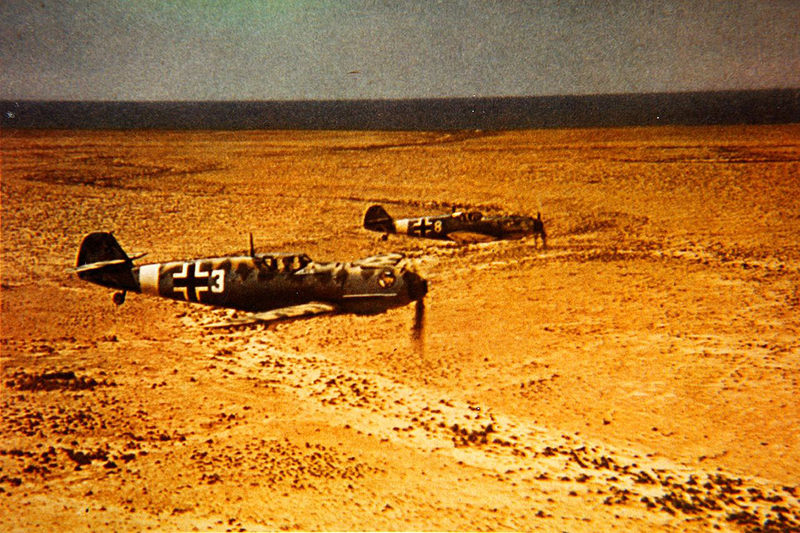 Bf 109Es of JG.27 flying over North Africa. While the pilots of JG.27 accounted for a huge number of enemy aircraft, the constant competition for the highest number of kills impaired combat effectiveness and drew focus away from the main objective of rendering the WDAF’s bombers and ground-attack aircraft ineffective. Following the final defeat of the Afrika Korps in Tunisia, JG.27 left the theatre on 12th November 1942, with a single Gruppe remaining until December, skirmishing with Kittyhawks until finally pulling out. JG.27 have the dubious honour of altering the course of history. On 7th August 1942, a flight of Bf 109s happened across a Bristol Bombay from No 216 Squadron, carrying the recently-appointed commander of the 8th Army, Lieutenant General William Gott. Repeated machine gun fire from the 109s forced the Bombay to crash-land, killing many of the passengers, including Gott. His replacement? A relatively unknown officer called Bernard Montgomery. To recreate this particular twist of fate, try playing the Transport Hunt scenario, where the transport aircraft uses the following stats. Speed 4, Agility 0, Firepower 0. Turret; Front and Rear 1, Multi-Engined. Contemplate the consequences should Gott survive! How would the 8th Army have faired without Monty at the helm. No. 112 Squadron took on pilots from across the Commonwealth, from Poland, Austraila, Canada and New Zealand. Originally fitted out with Gloster Gladiators, No.112 Squadron found itself defending Egypt from Italian bombers. After savaging the Italian formations, it found itself transferred to Greece, providing air cover and support over Albania. Following the defeat of the Allied forces in Greece, the squadron retreated to Crete, and then Egypt, where it rejoined the North African campaign. In Egypt, it was one of the first squadrons to use the Curtiss P-40 Tomahawk in combat. Inspired by the gaping air intake under the aircraft’s nose and the Bf 110s of ZG.76, the squadron painted their aircraft with distinctive shark mouths, earning the moniker of Shark squadron. A P-40 Kittyhawk of No. 112 Squadron taxiing through the North African scrub with an airman on the wing to guide the pilot past the ever-present obsticles. No. 112 Squadron took on pilots from across the Commonwealth, from Poland, Australia, Canada and New Zealand. Several Aces began their careers in the ranks of the Shark Squadron, including the highest scoring Australian Ace of the war, Clive “Killer” Caldwell. The P-40 was broadly equal to the Bf 109E at low levels, but the inability of some pilots to exploit the strengths of their new aircraft and their use as fighter-bombers meant the Bf 109s were able to scream in from high altitude, blasting aircraft from the sky and escaping before the rest of the squadron could retaliate. Building on their First World War origins, No. 6 Squadron operated as the army’s eyes and ears, their Lysanders ranging back and forth over enemy lines, spotting targets for artillery units. In one instance, a Lysander pilot located the enemy and then landed alongside the artillery battery to properly direct their fire. 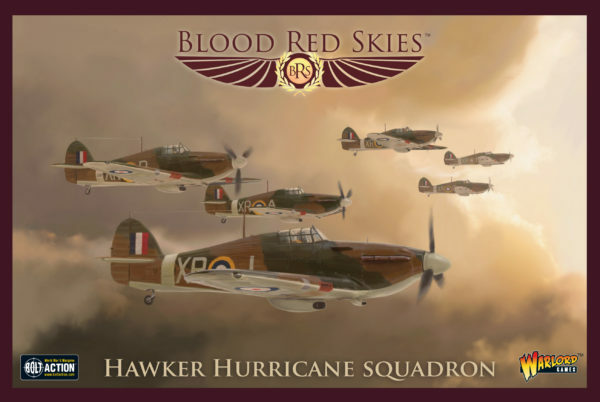 The squadron remained divided, with half remaining in Palestine until the whole squadron could be equipped with Hurricanes. After receiving the new aircraft, the squadron came up to full strength and undertook numerous ground attack missions in support of the 8th Army. Initially, the squadron was equipped with the Hurricane II B armed with 12 x .303 in (7.7 mm) harmonised at 200 yards. This devastating weight of firepower wasn’t enough to out-perform the formidable Messerschmidt. Moving into the “Hurribomber” roll and now equipped with either four 20 mm (.79 in) cannon and a 500 lb (230 kg) bomb load (MkIIC) or the more impressive under-wing 40mm cannons (MkIID), the Hurricane was perfect for carving up columns of tanks and light vehicles, earning the squadron its nickname of Flying Can Openers. A flight of Hurricanes from No.6 Squadron have been bounced by Bf 109s scything out of the sun. Off in the distance, Tommy Atkins and the 8th Army are in desperate need of air support – a strafing run of 40mm cannons might change the course of the battle! Play any scenario of Blood Red Skies you like. For every Hurricane that survives the battle unscathed, gain a free Air Strike in your game of Blood Red Skies. 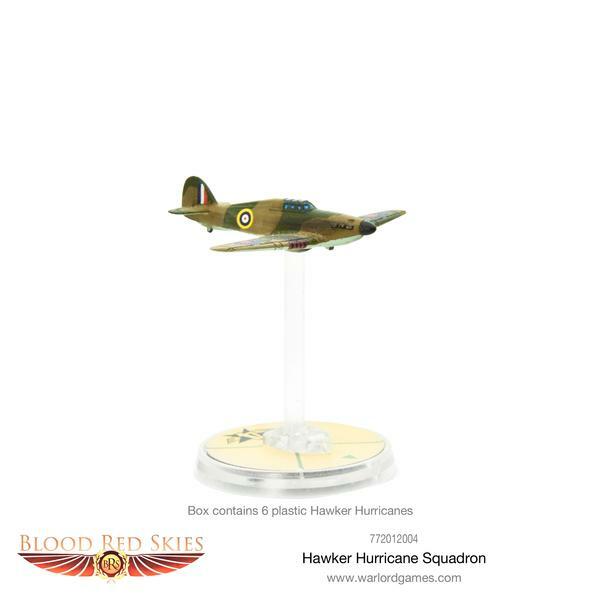 Join JG.27 or the RAF by grabbing some of our fantastic Hurricanes or Bf 109s! The post Battle Overview: Air War Over North Africa appeared first on Warlord Games.